Starting out: we initially climb up to gather ourselves at Tvargastein, Arne Naess’ cabin high in the central mountains of Norway. For many years his cabin was the highest private home in all of northern Europe; it is still accessible only by two hours’ hike up from the nearest road. Norwegian folklorist, organic farmer, and storyteller extraordinaire, Jorunn Barane. Swedish environmental educator, Isak Stoddard — laying stones and then climbing atop a tent we helped erect on a mountain farm. ancestral knowledge, practices, and traditions rich in song, dance, ecstatic trance, animal tracking, interspecies communication, plant knowledge, and low-impact flourishing skills – all of which are under increasing threat from harsh and exploitative land-development schemes. To this end, in late March of 2017 Alliance director Dr. David Abram will co-lead a ten-day expedition to the Kalahari Desert of Botswana, in partnership with tracker Jon Young and Dr. Nicole Apelian, to visit and learn from a remarkable hunting and gathering community of Naro San Bushmen, practicing the arts of tracking and bird language with an exuberant people whose culture is now recognized as one of the most ancient and venerable human traditions still in existence anywhere on Earth. Evenings will be spent sharing stories and songs, trance dance and healing with the San around their communal fire. 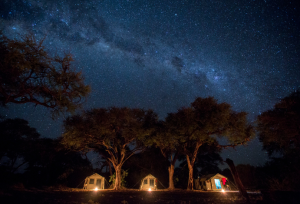 The second half of our journey will be spent honing our nature-awareness skills in the outrageous exuberance of the Okavango Delta, one of the most wildlife-rich places in all of Africa. We are accepting only 12 participants on this expedition, which will start and end in Maun, Botswana, and will run from March 26th through April 4th of 2017. If you are interested in joining us, please contact us as swiftly as possible, by visiting this website. Many persons, today, feel a buoyant sense of possibility with regard to the near and longterm future, an upbeat and expectant optimism fed by the rapid and unceasing emergence of new technologies (and the new forms of association, communication, commerce, and transport made possible by those inventions). At the same time, many other persons are beset by a deepening malaise whenever they contemplate our collective future,a sense of despondency and eerie gloom triggered by the rapidly metastasizing signs of ecological breakdown, biodiversity loss, and runaway climate change. How can we best make sense of this odd juxtaposition of moods? What are the actual relations between these two ostensibly contrary currents – deepening ecological catastrophe (with its concomitant tone of melancholy) and rapidly burgeoning technology (with its attendant technological utopianism)? The Alliance for Wild Ethics is working to disclose the hidden patterns that connect these apparently divergent trends within society. By our focus upon sensorial experience, and by our engagement with indigenous communities and place-based practices, we aim to counter ecological despondency with a dawning awareness of new-old possibilities as yet unglimpsed within the dominant cultural mindset. Yet we also work to temper the techno-utopian zeal of our fellow citizens with a clear-eyed and grounded awareness of earthly and ecological constraints. We have no wish to disparage (much less demonize) technological innovation and know-how. Rather, our aim is to carefully develop and articulate a powerful set of ethical principles for the development and deployment of technologies in the era of mass extinction. While climate destabilization affects every aspect of human existence, it remains – for most persons – an exceedingly abstract process (operating at spatial and temporal scales far beyond their direct experience) with little bearing upon how we go about their daily lives. Hence politicians, business leaders, and policy makers are still able to ignore the mountain of evidence with little pushback, and to endlessly postpone making the difficult decisions necessary to protect our descendants and to safeguard the rapidly-dwindling biodiversity of the Earth. As a counter to such abstraction, the Alliance for Wild Ethics works to galvanize awareness and catalyze action by communicating a much more direct, visceral experience of our human entanglement with the rest of the biosphere. We offer fresh ways of demonstrating each individual’s interdependence with other species, with the soils, with the waters and the shifting winds of this planet. In contrast to conventional discourse, which articulates global warming in the rarefied language of “parts per million carbon dioxide,” we help planetary citizens to recognize that the climate is as close to us as the unseen air flowing in and out of our nostrils (as crucial, and as easy to take for granted, as breathing itself). We have helped tens of thousands of people to discern the atmosphere as a sensitive organ of this planet, an invisible ocean generated by the interbreathing of innumerable plant, animal, and bacterial species, including ourselves. And hence that we live not ON the Earth but rather IN the Eairth, in the depths of this breathing planet. The Alliance for Wild Ethics draws steady insight from the natural sciences, attentively engaging current developments within biology, geology, and earth systems science, interrogating the rich discoveries arising within ethnobotany and cultural ecology, neurobiology and physical cosmology. But while the evidence of the sciences, today, is often framed in arcane and jargon-ridden language laced with statistical abstractions, AWE works to steadily translate these quantitative disclosures into the more qualitative language of felt experience. What bearing do these findings have upon our direct, visceral encounters with one another and with the living land around us? By undertaking such translation, AWE works to retrieve direct experience from the ongoing technologization of everyday life, and to correct the dangerous misconception that the human intellect is in any way separable from the human body in its ongoing interchange with the animate Earth. How does the human creature attune to the rhythms of a place; how does the human animal move within the more-than-human terrain? Starting in 2012 the Alliance for Wild Ethics began exploring, cultivating, and now enacting a powerful emergent practice for aligning the human animal with the animate earth. In this era of transformation, when so many are struggling to meet the biospheric changes now upon us, PlaceDancing is an improvisational adventure into the felt space between the body and the breathing land. Developed by cultural ecologist David Abram and by choreographer Taira Restar, PlaceDancing is a practice whereby persons of divergent backgrounds and ages begin to awaken their creaturely senses, slipping into subtle movement and dynamic interchange with trees, rocks, sunlight, wind, cricket-rhythms, soil and mycelial webs, high-stepping herons and billowing cloud-shadows. We inquire: how does the many-voiced intelligence of a particular place speak to, and through, your person? Using dynamic empathy, improvisational dance, organic interplay with bodies human and other-than-human, spontaneous sounding and earthly poetics, in each extended workshop participants practice both as individuals and in ensemble. Under such titles as “Rock Tree Cloud” or “Wind Rock Wave,” we have enacted multiday PlaceDancing investigations in diverse bioregions – from the desert southwest of North America to Point Reyes National Seashore, from the Rocky Mountains to the islands of British Columbia – and we will gradually bring this dynamic ecological practice into many more ecosystems. In 2017, AWE will begin training other PlaceDancing practitioners to spread this practice into a diverse range of cultures and communities. Members of the Alliance have been carefully developing a collective healing tradition, a practice that takes variant forms in different places. Reciprocal Medicine brings various members of a community together for regular gatherings (whether once a month, or four times a year) during which the participants intentionally bind their collective intelligence to the manifold sentience of the local earth, affirming and honoring the more-than-human agencies that inhabit and compose the surrounding terrain. The practice of Reciprocal Medicine can be viewed as a non-sectarian ritual open to spontaneous expressions of gratitude to the more-than-human community of beings, as well to deep-hearted expressions of grief for new wounds and losses undergone by the local earth (new oil spills, losses of habitat, interrupted migrations). It is an emergent ceremonial form arising in response to slowly mounting ecological disarray, and to the societal fracturing, resentment, and violence that can rise in the wake of such disarray. Weaving unforced, oral eloquence with resonant silence, throughout the practice participants engage in deep listening to one another and to the many-voiced landscape, carefully remembering themselves to the broader collective of animate beings. Participants feed that wider collective with their affections, appreciations, and their spoken praises, then draw upon the unique medicines of that wider collective in order to acknowledge, soothe, and alleviate wounds to individuals and/or families that have experienced grievous and unexpected loss, and know not how to reconcile themselves to such losses. From the silent and reciprocal exchange of breath with the local plants, participants collectively bring attention to their alliance with the soils and the rains and the rivers of that realm, to their solidarity with the manifold plants and the diverse animals of the watershed, and to their alliance with local landforms and weather patterns. They then call upon the strength of this renewed alliance to interrupt, intercept, and transform the age-old human impulse toward scapegoating and blame, inviting the medicine of this earthly solidarity to enfold and dissolve the human instinct to inflict violence on others whenever hard times are at hand. For it is now apparent that instability, difficulty and loss will intensify in every part of the biosphere throughout the present century and likely beyond. In this era of high population and big technology, neither humankind nor the rest of nature can long withstand the internecine hatred and reckless aggression to which our species has shown itself to be prone. The practice of reciprocal medicine, between persons and places, is thus an ongoing practice of solidarity, an evolving culture of awakening to which we commit ourselves. There is nothing religious about this practice (although it may be engaged in by persons of every faith and by persons of no faith). Rather, the practice adheres only to our most immediate and directly-felt encounter with the more-than-human community of life, and with one another as plain members, and citizens, of that breathing commonwealth. A feature-length documentary inspired by the work of David Abram is currently in production. Directed by two visionary artists, the multiple award-winning Canadian filmmaker Peter Mettler (Picture of Light; Gambling, Gods, and LSD; Petropolis (Aerial Perspectives on the Alberta Tar Sands); The End of Time) and the Scottish documentary director Emma Davie (I Am Breathing). Filming began in Wyoming in the autumn of 2015 and was completed in 2016; assuming that the necessary funding becomes available, editing will get underway in the summer of 2017. In addition to current projects, AWE regularly facilitates lectures, seminars, workshops and trainings that seed and spread various facets of Wild Ethics (the place-based ethical principles and practices developed and honed in ongoing collaboration among members of the Alliance). AWE also lends its support to depth-ecological research and incisive writing that furthers its ethical aims: opening new opportunities for reciprocity and deepened rapport between humans and the more-than-human earth. Please consider making a tax-deductible donation to sustain the ongoing work of the Alliance for Wild Ethics. We put your donation to great use in support of the exuberant, many-voiced Earth. Thank You!